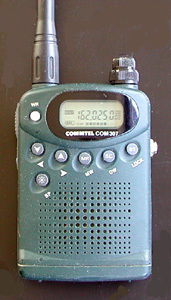 The Maycom AR-108 and the identical Commtel COM307 and Albrecht AR106 are usually marketed as an 'airband scanner'. In spite of that, the European version covers 108-180 MHz, so it can be used for AIS and VHF paging reception. If you have the US version, you should bridge the solder pads marked 'OP 4'. 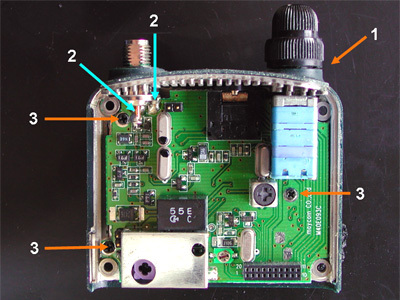 This changes the FM reception range from WX channels only into full VHF (136-180 MHz). [Thank you, Jon Z. for pointing this out]. The discriminator IC is a TK10930. Remove the volume- and squelch knobs and remove the washer from the potentiometer with a pair of fine tip pliers. Remove the three screws that connect the board to the housing. 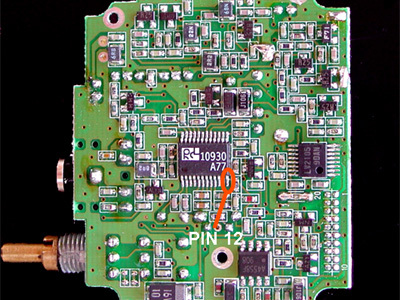 A piece of wire is connected to pin 12 of the receiver IC. 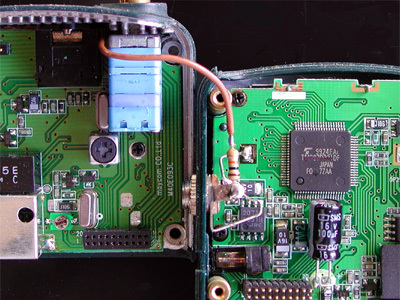 The wire can be fixed to the IC by a drop of glue from a glue gun. After leading the wire to the other side of the circuit board next to the volume- and squelch potentiometer, the board can be mounted in the case again. A 3.5 mm chassis socket is mounted in the scanner's other half. The signal lug is connected to the wire running from the receiver IC through a 10 k resistor. 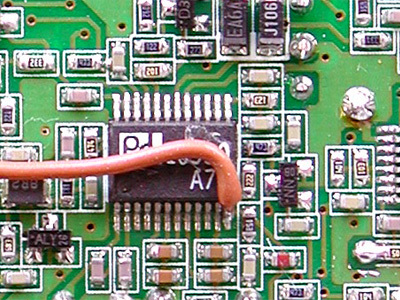 The socket's ground lug is connected to a blank piece of copper clad nearby by a small piece of wire. You can see this wire running left of the resistor.